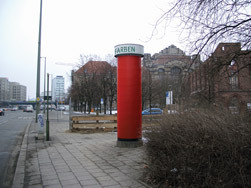 Farben / Colours is a sound installation in public space. It creates a poetic soundscape which plays with how visitors experience time and space. Space accelerates and decelerates, lightens and darkens. With the aid of sensors, visitors’ movements become the parameter for the installation’s activity. The starting point is public space with its sounds and noises in its architectural, social, functional and rhythmic structures. The musical language of the composition evolves out of these colours (characteristics), as do the sound material and compositional strategy which continually re-engage in dialogue with the acoustic events at the site. Sound material is recorded here while pre-produced segments are adjusted to it. The composition comes together within this concrete space. A two full range loudspeakers attached to the inner wall of the left side aisle. B two Philips horn loudspeakers, one installed high in the portal and the other at the head of the left aisle. Both loudspeakers face the interior. C a “Cube” (concrete cube loudspeaker, on loan from O+A) positioned at the altar. A, B + C are extremely different in the way they sound and emit sound. A represents the “neutral” loudspeaker sound familiar to us. B the horns color and alter the sound. C is a concrete cube loudspeaker with a neutral sound, unusual in its appearance and the way it emits sound; its sound is non-directional. Bruce Odland and Sam Auinger developed the “Cube” in 1990 for installations in public space. The five loudspeakers are played by a sampler that contains the composition (midi file) and the sound material (samples). The sampler is controlled by a logic board.